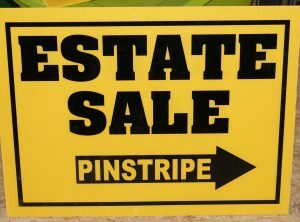 Pinstripe Estate Services is a Utah first company with more than 20 years of experience in the resale industry. We are committed to helping our clients quickly get the most out of their assets. We are licensed with the state of Utah and insured. For friendly, professional service with trustworthy, hardworking and experienced associates call Pinstripe Estate Services. We service Estate Sales in the Greater Lehi, Highland, Alpine, Pleasant Grove, American Fork, Lindon, Orem, Provo, Springville, Mapleton, Spanish Fork, Salem, Payson and surrounding areas. Just give us a call at 801-400-2139 and setup a free, no obligation consultation. Integrity First-- Integrity is a character trait. It is the willingness to do what's right even when no one is looking. It is the moral compass, the inner voice, the voice of self-control and the basis for trust. Service before Self-- Our professionalism will always shine through- our company is founded on the desire to help others during their time of need. You can put your trust in Pinstripe Estate Services. Our 20 years of sales experience will help you get the most from your assets. We have excellent staff, who are highly qualified and trustworthy. We look forward to serving you!